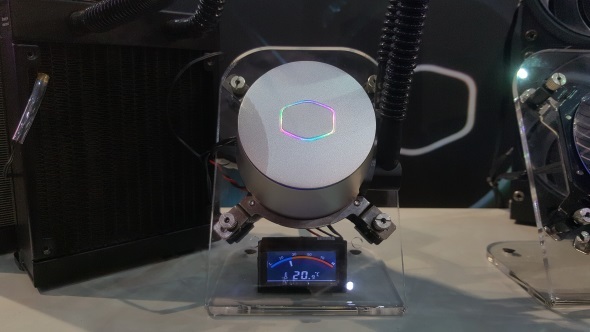 In classic Computex style Cooler Master is showing off a thermoelectric CPU cooler design concept on its stand, but it’s one that’s practically finished and will be on the shelves by the end of the year. And, if you’ll pardon the pun, it’s very, very cool. 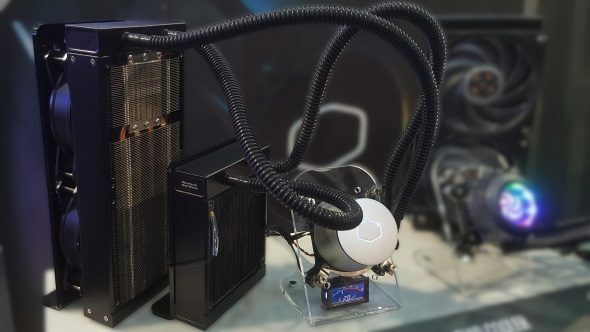 This isn’t the first time Cooler Master has tried to harness the Peltier effect for CPU chilling, its now-discontinued V10 hybrid air-cooler held that distinction. But given that it’s been discontinued you can probably tell how well that went down… This is, however, the first all-in-one liquid CPU cooler the company has used to chill its chips. Your silicon getting too toasty? Calm your CPU down with the best liquid coolers. Thermoelectric cooling, also known as the Peltier effect, is the process of adding an electrical charge to a specially designed cooling plate in order to encourage the effective transfer of heat from one side to another. In this case the hot side is touching the coolant and shifting that residual heat out into the attached heatsinks. This is a different approach than other Peltier liquid coolers I’ve seen, the thermoelectric contact point isn’t connected to the actual CPU and Cooler Master hasn’t just electrified the reservoir. Both of those alternative approaches are part of why Peltier coolers aren’t popular – they can create condensation as the effect occurs. And that kind of CPU-meets-water kind of thing really doesn’t help the cool running of your PC. In fact it kind of makes it go fizzle pop. To stop that happening Cooler Master’s chip chiller puts the coolant through a two-pass system. First the heated coolant goes into a reservoir where it gets one level of cooling, and then it gets passed into the actual thermoelectric reservoir where the Peltier effect takes the coolant down another notch before pumping it back to the CPU block. Which has funky ARGB lighting in it, because of course it does. Cooler Master estimates that this approach allows it to gain another 7-8°C difference in temperature compared to a standard AIO liquid cooler. To combat the other reason Peltier coolers are generally avoided, namely high power usage, the Cooler Master version only activates its thermoelectric system when the CPU is being stressed. In idle mode it stays off, only powering up when the system requires its help. Cooler Master’s Thermoelectric coolers will be available in a vague Q4 timeframe – as so many other Computex products seem to be – and will come in both 120mm and 240mm form factors. But here’s the rub, there will only be around a $20 difference in price between them. Unfortunately that price is going to be somewhere around the $300 mark.